High-flying dancers from the Lenihan School of Irish Dance perform traditional Irish dances at the Pequot Library -- a Saturday prelude to St. Patrick's Day. 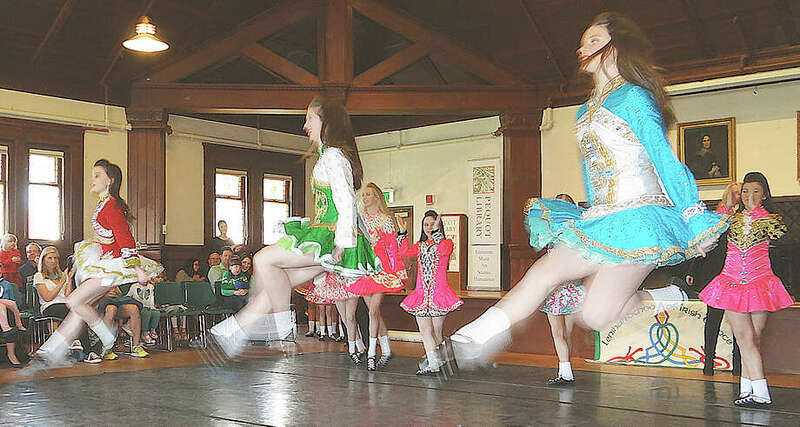 FAIRFIELD — In step with St. Patrick’s Day celebrations of Irish culture, a lively performance of traditional step dancing was hosted Saturday by the Pequot Library. The brightly costumed troupe of dancers from the Lenihan School of Irish Dance stepped up to the occasion with a dazzling display of intricate foot work and kicks before a full house at the library. As the hour-long performance wound to a close, people in the audience were invited by the dancers to join in the fun and to learn basic steps and kicks of the ever-green traditions of Irish dance.